Devastating News Today, darn it! Heidi’s tumor markers not only went up but doubled. So this new chemotherapy failed completely, like the one they tried in December/January. We will hear what option(s) are left sometime tomorrow. My own outpatient surgery is tomorrow morning at 8am, another unwelcome surprise. We’re really grateful to all of you for your kindness and support. My beloved wife has metastatic breast cancer (spread to lungs, bone, liver). I am a prostate cancer survivor and my bladder cancer is in remission. We are both treated at Seattle Cancer Care Alliance. But we love God, we love life’s adventures, we love our family & friends. And will do so until God takes us Home. We are followers of Christ. I’ve never met Joe and Heidi Hendricks face to face. I suppose I could, since we live only about a day’s drive away from each other. However, through the “magic” of Facebook, I have shared the last few years of their cancer battle together. The photo I’ve posted is number 56 in their scenes from our cancer battle. The most startling thing for me about photo 56 is that Joe and Heidi aren’t smiling. No, I don’t expect them to smile after such terrible news, but if you go through their “photo album,” even in the most dire of circumstances, they’re always smiling and joking and pressing on through adversity. Humor is almost the last tool to fail when all other tools have long since burned out in the course of such a tremendous physical and emotional drain. I must admit, mine would have been shot through like swiss cheese in a hail storm long before this. But Joe particularly always makes me laugh. Besides their sense of humor, the thing I admire most about Joe and Heidi is their faith. A lot of Christians say they have faith and trust in God…that is, until something really bad happens. Then it all goes flying out the window and it’s “Why did you let this happen to me, God?” and “How could you be so cruel to me, God?” I’m sure I’d be among that group if I had to face the scenes from Joe and Heidi’s cancer battle first hand. But no matter how grim it’s been for them, they’ve always grasped tightly onto the hand of God and never let go, just as love has bonded Joe and Heidi together and the never let go of each other. I’m angry. No, not at God…well, not exactly. I don’t who or what I’m angry at. I think it’s that I feel really helpless and frustrated. Sounds strange, eh? There is horrible tragedy happening all over the world. Every day, someone suffers. Every day, someone dies. Every day, some act of injustice is committed, the helpless are victimized and have no defender, the innocent are made to pay for the crimes of the oppressor. It’s a broken world. But in the face of all that, I’m angry at the news of Joe and Heidi’s cancer battle today. I know the world isn’t fair, but I’m still angry. It isn’t fair. It’s like my feelings have mass and can be affected by gravity. It’s like the muscles that hold up my feelings are tired and my sadness is a lead weight, pulling my shoulders down and anchoring me to my seat. I feel as if I’m slowly being pulled to the floor. It’s as if my only light is losing its brightness, and I’m just getting more heavy and silent and it’s getting dark all around me. The light of laughter is going out in the world. How many people of faith have asked that question across the long stretch of centuries? How many Christians and Muslims and Jews and whoever else have asked God where He went off to when horrible news, disease, injury, and death stalked us one by one? Is this what ancient man felt like, cowering in some cave in the night, listening to the predators crying out at the moon and declaring to the grey, reflected light that they would find you and consume you? Is that what it feels like knowing that there is a cancer inside of you and it’s taking over and it won’t be chased away? I’ve heard the words “God is in control” said countless times in countless church services, but what do the words really mean? God is in control, but people still get sick. God is in control but people still get hurt. We’re alone, and we’re scared, and we need to be able to hang on when our strength, and our stamina, and finally our laughter is dried up like the last drop of water feeding the last wilted flower in the brilliant summer sun baking the vast and endless desert. God, don’t go away. Stay with Joe and Heidi, no matter what happens. We all want a miracle, but the greatest miracle is that You even care. 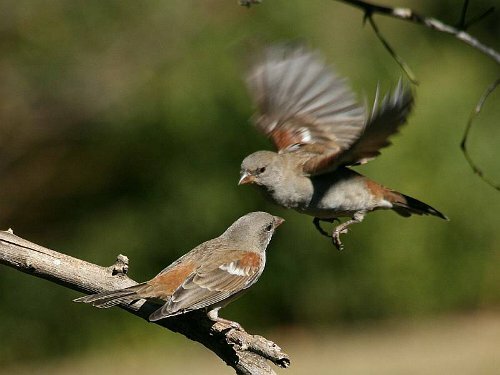 If not even one tiny sparrow falls to the earth apart from the will of the Father, then You are mindful of Joe and Heidi, for they are worth much, much more than sparrows. Stay with them God and, if it is Your will, don’t let them fall. Let them fly. Does anyone “know” these people? As in; if they have good insurance, means to care for their needs outside of cancer? I would so like to do something for them, besides just pray! Please let me know… My prayers are certainly with them! I pray that not only will God care for them like he does even the sparrow, giving them wings to fly; but that he will -one day soon- renew their strength, so they may “mount up with wings- as eagles!” God bless Joe and Heidi!! @Angela: I don’t know Joe and Heidi’s financial situation, but you may be able to go to their Facebook page and ask them. However, praying for Joe and Heidi is no small thing and God does hear the prayers of the righteous. Thanks. Excellent post! When my dad was sick with pancreatic cancer he was surrounded with family and prayer. He “called for the elders for anointing” and they “prayed the prayer of faith” and yet he died. Not only him, but nearly all the men who were his friends died too, mostly of cancer. My Granddad and Grandma died of cancer. But, like Joe and Heidi, they faced it with courage and humility. Maybe that was the reason for it all? Even this, G-d will turn to his glory! That testimony really moved me, and it shows me the battle is won already! This is such a “mixed feelings” area for me, Steven. On the one hand, we have the “religious platitudes” area where we say that all things are for the glory of God. I can’t really deny that, since God is Sovereign over all, but it tends to diminish the reality of human suffering, which I’m sure you know all too well, especially having watched your father die of cancer. Frankly, I watch Joe and Heidi go through all that Joe and Heidi go through day after day (they are very candid on Facebook), and can’t imagine how I’d face such things if it were me and my family. I suppose I could fall back on “peace beyond all understanding,” (Philippians 4:7) but that seems kind of shallow too, since I know that, despite all of the smiles and laughter, they also have their share of tears…and more. All I can do is pray…and write, because it’s what I do when I can’t do anything else. I just read the part of Thomas Merton’s autobiography where his Father dies of a brain tumor. I can’t describe all of the parallels to this blog as well as my life, but I imagine I’ll blog about it at some point. Pingback: More than Conquerors « To the Assembly, with love…. Thank you so much James for this blog entry and the extra prayers I know it creates! You have become such a wonderful & inspiring friend to us both. Angela: thank you, we do have insurance and amazing financial support from family that helps us meet what insurance does not. I can honestly say that my wife’s consistent response in the past 48 hours since the terrible news has been “God please use this for Your Glory, even though I cannot see how it could.” Lots of crying, but no despair. None.